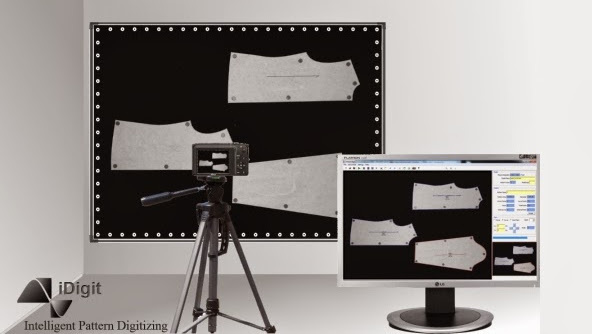 "Digitize in a Blink of an Eye "
Photo Digitizing is getting more popular recently due to advantages it bring, such as high speed and accuracy and less work space requirement. iDigit Pattern Digitizer digitizes patterns in just a few seconds as opposed to table digitizers which is time consuming. The magnetic canvas is fixed on the wall, therefore occupying no extra space in your working environment. iDigit does not require calibration which is time consuming at installation and makes the system prone to error if any component is relocated. iDigit converts pictures into patterns with precision of table digitizers. In case you'd need adjustments to the patterns, iDigit provides you with functionalities you need. iDigit is compatible with all major CAD software via Dxf export.